The eruptions, which have a major impact on one of the world's richest fisheries, are more frequent and widespread than anyone realised. Namibia - Undersea eruptions of noxious hydrogen sulphide are having a major impact on one of the world's richest fisheries. Satellite images show that toxic eruptions off the coast of Namibia are more frequent and widespread than anyone realised. The world's most productive fisheries are found in upwelling regions of ocean, where wind-driven currents fertilise surface waters with nutrients from the deep. The Benguela upwelling along Namibia's coast has the strongest such currents in the world. 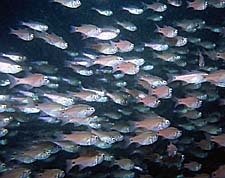 The area supports a fishery that was worth around $400 million in 1998, providing Namibia with its second largest source of revenue after mining. But trouble bubbles beneath these productive waters. Microscopic algae called diatoms grow where upwelling is most intense. These are grazed by plankton, but any that are not eaten sink when they die, forming beds of sediment on the seafloor. Bacteria in the sediments break down the diatoms and produce hydrogen sulphide in the process. The sulphide builds up in gas pockets that eventually erupt into the ocean, poisoning marine life and stripping oxygen from the water. Scarla Weeks of the University of Cape Town in South Africa and her colleagues in Namibia and Florida have examined satellite images of the region to assess the scale of these potentially devastating events. The eruptions appear as milky patches, thanks to the slurry of sulphur that forms as sulphide oxidises at the surface. The researchers found that there were nine major hydrogen sulphide eruptions in 2001. The largest one smothered 22,000 square kilometres of ocean. "These events are not new - they are known from the turn of the last century," says Weeks, "but they were always understood to be very small, localised effects." The eruptions appear to be triggered when the wind-driven upwelling becomes stronger, or when a low-pressure weather system passes overhead. Either scenario may reduce pressure on the seabed enough for the sulphide to escape, the researchers suggest. "Small changes in pressure can mobilise the gas and cause it to rise," agrees Volker Br�chert of the Max Planck Institute for Microbiology in Bremen, Germany, who led a research cruise to the area in 2003. But he questions whether the eruptions alone can account for all of the sulphur seen in the satellite images. "Continuous diffusion of hydrogen sulphide from the sediment and changes in current patterns may also explain these events," he suggests. Whatever the cause, the events are having a serious impact on the fishery's stock. For example, a widespread depletion of oxygen is blamed for the deaths of two billion young hake in 1993 - half the fishery's young fish. Fish stocks crashed to 30 per cent of their previous level in the following year. "We know that the collapse of the hake was due to a huge anoxic event in 1992 to 1993," says Weeks. The team hopes that monitoring gas eruptions and understanding what triggers them will help authorities take sulphide events into account when setting annual catch quotas. So far, the eruptions appear to be unique to the Benguela upwelling, but Weeks is worried that climate change might make similar regions elsewhere susceptible.